Archive of 2012 PNC Info. 12/20/12 - The December, 2012 issue of Coil Line has been posted. Those members who elected to receive Coil Line electronically will receive the URL soon. Westin Chicago Northwest Hotel  400 Park Blvd  Itasca, IL. 10/25/12 - The November, 2012 issue of Coil Line has been posted. Those members who elected to receive Coil Line electronically will receive the URL soon. 9/27/12 - All of the data in the 'PNC Master List' on the 'PNC Data' bar on the left has been updated to include 2012 issues. 9/25/12 - If you reached this page by entering www.pnc3.org, be aware that the server is redirecting to an old version of the web site with many outdated links. Please use the following back-up link until we can get the redirect problem fixed. www.pnc3.us/pnc3.org. This link will take you to the most current web site, which will look just the same as what you are now looking at. Sorry for any inconvenience. 9/24/12 - The October, 2012 issue of Coil Line has been posted. Those members who elected to receive Coil Line electronically will receive the URL soon. This issue contains the fall auction bid sheet. 9/12/12 - We are experiencing problems with the server, and some of the links are not working. To access the current front page, go to www.pnc3.org. There will be time for socializing, trading, selling and buying PNC material. The Plate Number Coil Collectors Club will have a table at the show. 8/25/12 - The September, 2012 issue of Coil Line has been posted. Those members who elected to receive Coil Line electronically will receive the URL soon. 7/25/12 - The August, 2012 issue of Coil Line has been posted. Those members who elected to receive Coil Line electronically will receive the URL soon. 6/25/12 - The July, 2012 issue of Coil Line has been posted. Those members who elected to receive Coil Line electronically will receive the URL soon. This issue has the Fall Auction Consignment Sheet. 6/12/12 - The PNC3 Annual Membership Meeting will be held at the APS StampShow, August 18th, in the Sacramento Convention Center, room 304. The Convention Center is at 1400 J Street (corner of 14th). The Annual Meeting is from 1 - 3 PM. A Board Meeting, open to all members, will be held from 9 to noon in room 304 also. 6/01/12 - Today, in San Marcos, Texas, the Postal Service issued a 1-cent Bobcat definitive stamp in one design in a pressure-sensitive adhesive (PSA) coil of 3,000 stamps (Item 789100). The 1-cent stamp features a bobcat. 5/25/12 - The June, 2012 issue of Coil Line has been posted. Those members who elected to receive Coil Line electronically will receive the URL soon. Rich Nazar has posted an updated free Microsoft Excel listing of PNCs on the Internet at http://www.usastamps.com/references/PNC_Catalog/Numbering_System/Basic_PNC_Catalog_Numbers.xls. The list includes all known PNC plate numbers and major production varieties. The listing is part of Nazar's on-line description of the numbering system developed for The Plate Number Coil Catalog. The web site ( http://www.usastamps.com/references/PNC_Catalog/Numbering_System/Basic.htm) also provides an overview of the collectible specialties within PNCs and explains how the mnemonic numbering system eliminates the need to memorize standard catalog numbers. 4/25/12 - The May, 2012 issue of Coil Line has been posted. Those members who elected to receive Coil Line electronically will receive the URL soon. 4/24/12 - A Regional Meeting will be held this coming Saturday, April 28th at the Plymouth, Michigan Show. The meeting will start at 11 a.m. at the new show venue, the Hellenic Cultural Center, 36375 Joy Rd, Westland, Michigan. There will time set aside at the meeting for 'Show-n-tell', trading and selling. 4/13/12 - Results for Auction #46 have been posted. Click here to see the results. 3/28/12 - Member dealer Michael Lipson has a new email address and a new website, as follows: Web site: www.angelfire.com/sd2/coilnumber/WebMain.html. Email: mblipson@hotmail.com. More information can be found by clicking the 'Collecting PNCs' tab and going to 'Member Dealers'. 3/25/12 - The April, 2012 issue of Coil Line has been posted. Those members who elected to receive Coil Line electronically will receive the URL soon. This issue contains a Catalog Order Form and a list of Life Members that we have not been able to locate. 2/25/12 - The March, 2012 issue of Coil Line has been posted. Those members who elected to receive Coil Line electronically will receive the URL soon. This issue contains a Catalog Order Form and the Spring Auction Bid Sheet. 2/22/12 - Today in Washington, DC, the Postal Service issued a Four Flags First-Class Mail® Forever® stamp (priced at 45 cents), in four designs in a pressure-sensitive adhesive (PSA) booklet of 20 stamps (Item 688100) and a PSA coil of 100 (Item 788700). The U.S. Postal Service® continues its tradition of honoring the Stars and Strips with the issuance of Four Flags. 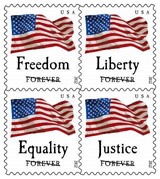 This quartet of stamps features a bright U.S. flag against a white background. 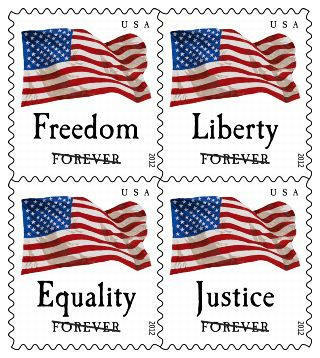 A single word appears on each of the four stamps in large letters: Freedom, Liberty, Equality, and Justice. Art directed by Howard E. Paine, the stamps feature an illustration by the late Arnold C. Holeywell. 1/28/12 - Report on items available at APS AmeriStamp Expo in Atlanta. PSA coil of nondenominated (25¢) presorted-rate definitive stamps featuring a Spectrum Eagle: Coil of 3000 (?). Plate number at 30 stamp intervals. Middle 5 digit black back number resulting in number on number. 32¢ "Aloha Shirts" in a PSA coil of 100. Plate number interval at 25 stamps. First plate number on the second stamp (the black Aloha Shirt) from the leader strip. 45¢ "Weather Vane" stamps in PSA coils of 3,000. Plate number interval at 25 stamps. Bottom red 4 digit back number. Odd roll - no number on number stamps. They have 5 rolls of 10,000 stamps which were not opened yet. 1/25/12 - The February, 2012 issue of Coil Line has been posted. Those members who elected to receive Coil Line electronically will receive the URL soon. 1/24/12 - Make plans to attend the Regional Meeting on Saturday, January 28th. It will be held during the APS AmeriStamp & Southeastern Stamp Expo at 3 p.m. in room 112. Stop by at the PNC3 booth to say hello and check for any changes in the meeting room. The show will be held at the Cobb County Galleria Centre, Two Galleria Parkway, Atlanta, Georgia. 1/19/12 - On January 3rd, the US Postal Service released a PSA coil of nondenominated (25¢) presorted-rate definitive stamps featuring a Spectrum Eagle. The single design stamps in coils of 3,000 and 10,000 were printed in six different colors. Today, sees the issuance of 5 different 32¢ "Aloha Shirts" in a PSA coil of 100. These are for the new Postal Card rate in effect January 22. Tomorrow, the US Postal Service will issue 5 different 45¢ "Weather Vane" stamps in PSA coils of 3,000 and 10,000.